UNBROKEN – The movie…Heart felt, Purposeful and Boring. 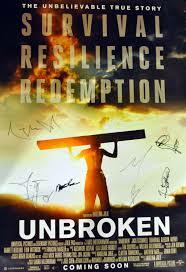 I finally got around to watching Angelina Jolie’s film of Laura Hillenbrand’s extraordinary book UNBROKEN. Jolie certainly enlisted the “A” Team, in terms of support. Joel and Ethan Coen wrote the screenplay. Roger Deakins’ cinematography was dazzling, as usual. All the production’s department heads were the best that money could buy. Why then, does this film lack the luster of the book? I found the film to be flat and impersonal – even criminally imitative at times. The fault here lies with the inexperienced director. She painted a pretty picture, but told a mediocre story. The plot is fractured, and the pace listless. While reading the book, I can remember wanting to jump up and cheer for its intrepid hero Louie Zamperini. In Jolie’s movie, there seems to be little to cheer about. Unlike the book, the film seems so purposeful, that its purposefulness is a distraction. The film can’t get out of its own way. It tries so hard to make some kind of statement that the purpose for that statement is lost. It almost seems like the neophyte director was in such awe (who wouldn’t be?) of her creative team, that she forgot she was in charge of them. Good story telling cannot be staffed out – it need’s one sure hand to guide the ship. 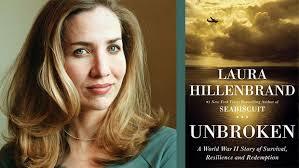 Laura Hillenbrand is the author of two extraordinary historical books. Ross, who wrote his own screenplay, did not seem intimidated by the enormous success of his source material – he seemed to embrace it. This was not just a story about a horse, but a historical tapestry of four broken souls, drawn together in heroic triumph within the intimidating shadow of America’s Great Depression. Ross’s first brilliant move was to hire the reassuring and America-friendly voice of historian David McCullough to do the narration. From the first sentence of voice over, the audience was aware that this was not just a race track movie, but a slice of Americana beautifully delivered by Ross, who seemed to understand the importance of Hillenbrand’s steady plot construction, and, for the most part, followed it. turned into manicured park, clean and lovely to look at; while walking through it, it becomes difficult to imagine the horrors that took place there in 1944. 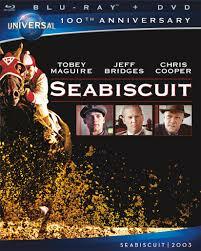 Both Seabiscuit and Unbroken are period stories that took place in easily recognizable slices of recent history. Ross used period gimmickry to his advantage, from McCullough’s familiar and reassuring voice, to Bill Macy’s hilarious radio announcer. Jolie’s images did not give me an authentic feel, which is absolutely necessary to support a period story. And the prison camp – What could she possibly have been thinking in trying to imitate the character relationship between Alec Guiness and Sessue Hayakawa in David Lean’s Bridge on the River Kwai. The relationship between Louie Zamperini and his camp commandant bore little resemblance, in Hillenbrand’s book, to the characters in Lean’s classic film. 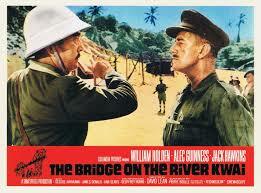 And just whose idea was it to duplicate, almost exactly, several very recognizable shots from the Kwai film? Homage or copy-cat culture? The Coen brothers are notorious for taking an element from one of their favorite old films and cleverly reworking it into a amusing visual shard in one of their movies. But the duplication of cinematographer John Hildyard’s photographic composition on the Kwai film is not clever, it is simply imitative and distracting. Make your own film, not someone else’s. The intrepid and triumphant Louie Zamperini’s character is played with skill by actor Jack O’Connell, but the performance seems to lack cohesion, and in some scenes believability. Zamperini carrying the log (see the poster) is presented visually far too much like the doomed Jesus carrying the cross to Golgotha. Again, a silly, almost embarrassing distraction. Director Angelina Jolie shown here with the real Louie Zamperini shortly before his death. Jolie’s Unbroken is nothing to be ashamed of, but this material in the hands of a seasoned story teller like Peter Weir, could have yielded something memorable. One can only hope that, if she wishes to continue directing, Angelina Jolie understands the mistakes she made here, and learns from them. Directors who are in awe of their source material (see Sidney Pollack and Out of Africa) never deliver what they could have, had they been confident and comfortable translating the book to the screen. This entry was posted on July 31, 2015 by shauncostello. It was filed under Fiction and non-fiction from Shaun Costello and was tagged with Angelina Jolie, Books, Books into Movies, Gary Ross, Jack O'Connell, Laura Hillenbrand, Louie Zamperini, Movies, Movies from books, Peter Weir, Review of the movie Unbroken, Seabiscuit, Sidney Pollack, Unbroken, Unbroken Review, When movies don't quite live up to expectations. how are u? let me know…miss u guys…God bless…oops, I forgot, you’re a democrat. Hillary bless u!